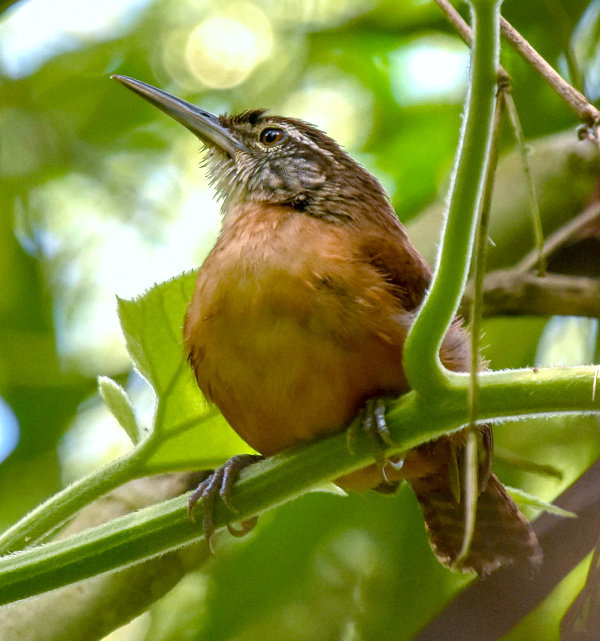 This interesting little Itatiaia Spinetail was one of our rewards for visiting the peak of Nova Caledonia. It was just one of the Brazilian endemics and other special birds that we enjoyed on the tour. Photo by participant Claudi Racionero. We started things in Rio and drove to the lovely Itororo lodge, the place we would call home for the next several days, with the knowledge that the days that preceded this tour were marked by a record amount of rainfall in the areas we visit for this tour. So, I was truly worried about the conditions in which we would be birding but we arrived with good weather and quickly fell into a totally different rhythm as we enjoyed the multitude of Hummingbirds and Tanagers that feast on the feeders right outside our lodge. Our hosts put us into our rooms and shortly after lunch we were out exploring the grounds of the lodge. Tiffany was quick to spot a Black-and-White Hawk-Eagle (the first of many great birds she would spot for us) and Michael called out a King Vulture which sent Andy running for his camera, as this was the very first sighting of this species for the lodge. The afternoon also had us looking at a Mantled Hawk, a scarce raptor that is endemic to the Atlantic Forest. Our luck with the weather and the birds continued throughout the tour and we only missed a single afternoon due to rains which is perfectly normal; after all it's called Rainforest for a reason! The days that followed had us working on different altitudinal bands over several days, thus getting to a different set of birds each day. From the lowlands of REGUA, where we enjoyed great looks at Chestnut-backed Antshrike, Unicolored Antwren, Blond-crested Woodpecker and many more, to the peak of Nova Caledonia, where we were treated to high altitude specialists such as Itatiaia Spinetail, Thick-billed Saltator, Black-and-gold Cotinga and passing through Macae de Cima, we enjoyed great weather, excellent birds and delicious food, turning each day into an exciting adventure. This tour is always a treat to lead but each of you made this a particularly enjoyable year for me. Thanks for joining me and I hope to see you all again some day. The endemic Three-toed Jacamar was another very special bird that we we had to travel to find, but it was well worth it for the view that we got. Photo by participant Claudi Racionero. BLACK-BELLIED WHISTLING-DUCK (Dendrocygna autumnalis) – A few individuals seen around the lake at Regua reserve. DUSKY-LEGGED GUAN (Penelope obscura) – You could set your clock by the time they showed up at the feeders every day. SPOT-WINGED WOOD-QUAIL (Odontophorus capueira) – Heard almost every day at the lodge, but despite our repeated efforts, only seen by Toni as one bird ran across the trail. MAGNIFICENT FRIGATEBIRD (Fregata magnificens) – Common around the airport in Rio. NEOTROPIC CORMORANT (Phalacrocorax brasilianus) – Seen near the airport and at REGUA. ANHINGA (Anhinga anhinga) – Also seen around the lakes at REGUA. GREAT EGRET (Ardea alba) – Seen near Rio's airport and on the day we moved into the interior to look for the Three-toed Jacamar. KING VULTURE (Sarcoramphus papa) – Michael spotted this one right from the veranda outside the dining area. A first time record for this species at the lodge. BLACK-AND-WHITE HAWK-EAGLE (Spizaetus melanoleucus) – Tiffany spotted this one right upon our arrival at the lodge. CHACO EAGLE (Buteogallus coronatus) – We had a brief but unmistakable view of this rare raptor on our way to our Three-toed Jacamar spot. We finally got a wonderful view of both male and female Giant Antshrike, after trying numerous times. This is the female, who seems to be curious about us. Photo by participant Ted Kavanagh. MANTLED HAWK (Pseudastur polionotus) – Seen soaring over the hills on our first day at Itororo Lodge. BLACKISH RAIL (Pardirallus nigricans) – We stopped at the edge of a marsh near Duas Barras and pulled one in for close inspections. SOUTHERN LAPWING (Vanellus chilensis) – A common sight in open areas. 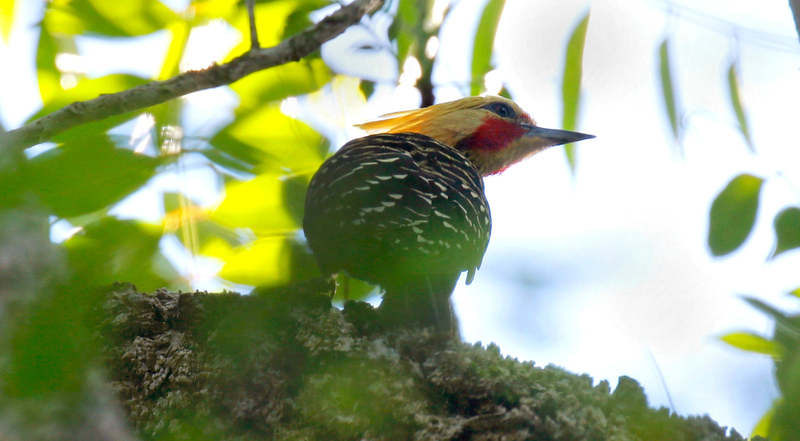 This Blond-crested Woodpecker was one of the lowland species we found around REGUA. Photo by participant Claudi Racionero. GRAY-FRONTED DOVE (Leptotila rufaxilla) – This is a forest species that is more frequently heard than seen, but we had multiple looks at them around Itororo Lodge. GREATER ANI (Crotophaga major) – A few individuals seen around the lake at REGUA. SHORT-TAILED NIGHTHAWK (NATTERERI) (Lurocalis semitorquatus nattereri) – Good views around the lodge. BLACK JACOBIN (Florisuga fusca) – A regular visitor of the lodge feeders. SCALE-THROATED HERMIT (Phaethornis eurynome) – The default Hermit on this tour and one that regularly visits the lodge's feeders. Although Buff-fronted Foliage-gleaner was common on the tour, they are beautiful birds, and we enjoyed seeing them. We even found a nest! Photo by participant Ted Kavanagh. VERSICOLORED EMERALD (Amazilia versicolor) – Seen a couple of times including a perched individual. 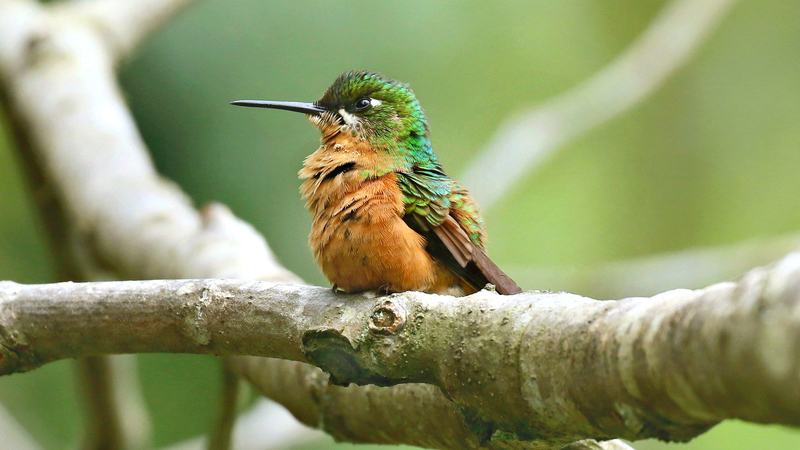 SAPPHIRE-SPANGLED EMERALD (Amazilia lactea) – A great spot by Tiffany. RUFOUS-CAPPED MOTMOT (Baryphthengus ruficapillus) – Seen briefly a few times as there was one individual nesting along a trail at the lodge. 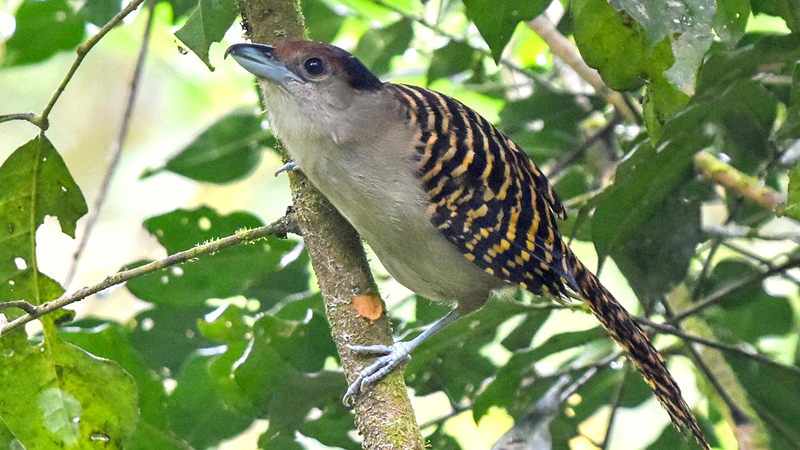 CRESCENT-CHESTED PUFFBIRD (Malacoptila striata) – This is a species of the drier areas of central Brazil that is slowly colonizing areas where the forest has been cleared. We saw them on the day we went looking for the Three-toed Jacamar. 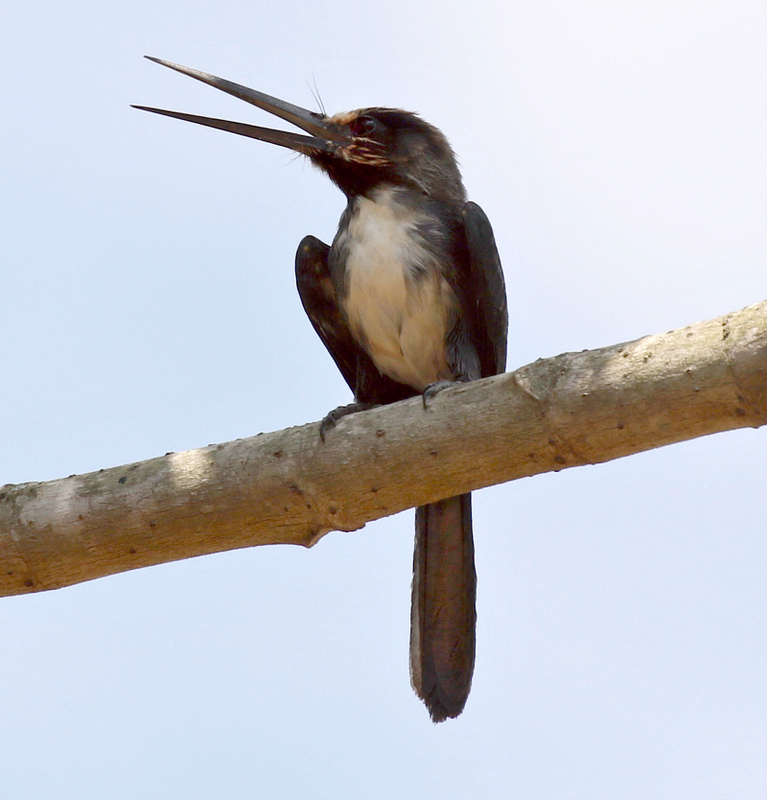 THREE-TOED JACAMAR (Jacamaralcyon tridactyla) – Endemic, range restricted and highly localized, but if you know where they are, they are quite reliable. Which is why we make the long journey from Nova Friburgo to Sumidouro. 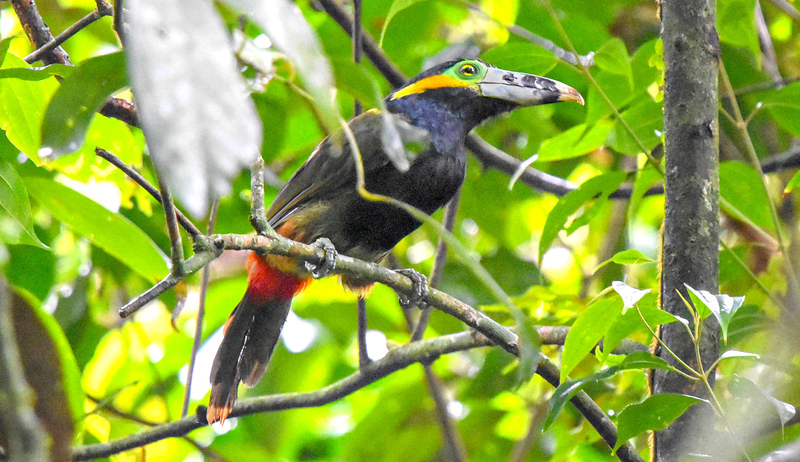 SAFFRON TOUCANET (Pteroglossus bailloni) – This one kept us in suspense until the last minute. Thanks to Claudi and Toni for spotting this one. SPOT-BILLED TOUCANET (Selenidera maculirostris) – Michael spotted our first one and we later had a couple more sightings of this Atlantic Forest Gem. WHITE WOODPECKER (Melanerpes candidus) – Another species that is moving in with the clearing of the forest. BLOND-CRESTED WOODPECKER (BLOND-CRESTED) (Celeus flavescens flavescens) – One of the great species we found when we birded the lowlands around REGUA. 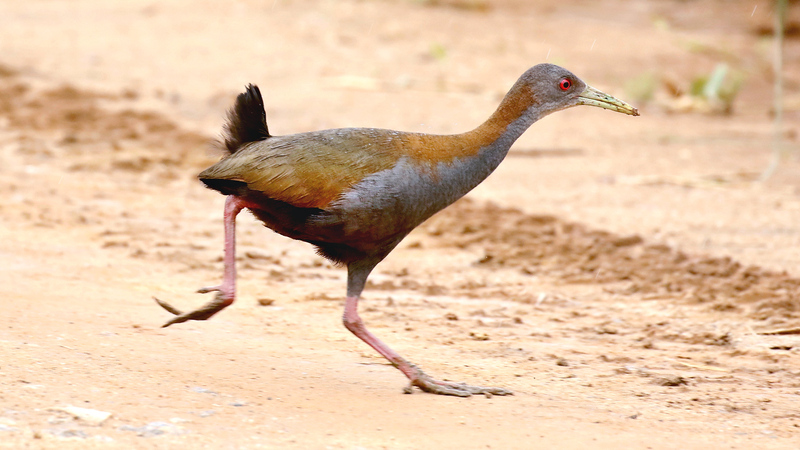 Participant Claudi Racionero caught this Slaty-breasted Wood-Rail as it ran across the road. 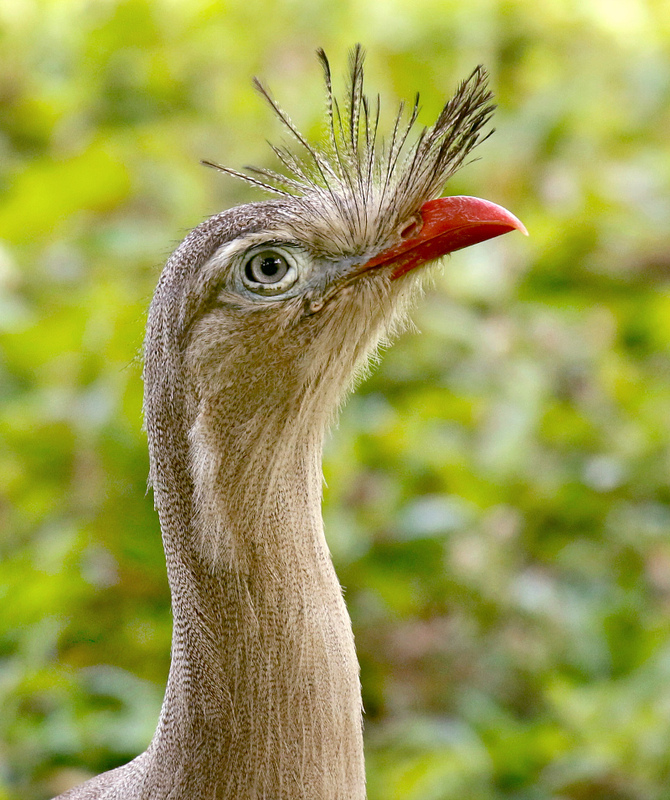 RED-LEGGED SERIEMA (Cariama cristata) – One of just two members of this South American Family. We had outstanding views near Pico Caledonia. BARRED FOREST-FALCON (Micrastur ruficollis) – Seeing a Forest-falcon is always a treat. 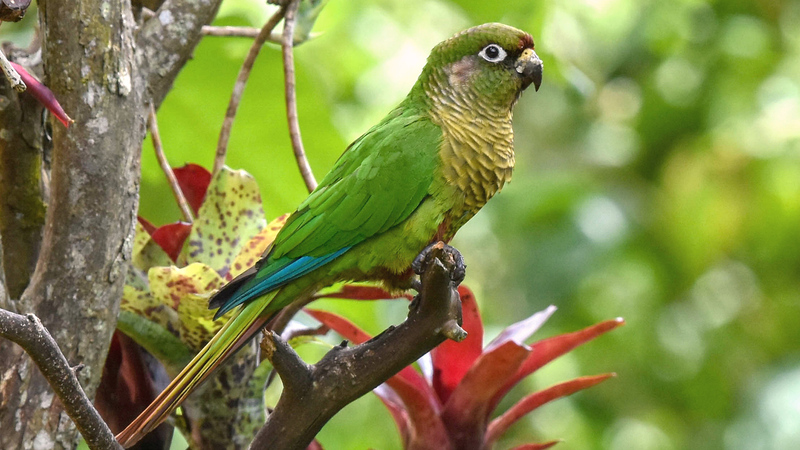 MAROON-BELLIED PARAKEET (MAROON-TAILED) (Pyrrhura frontalis frontalis) – A regular at the lodge's feeders. BLUE-WINGED MACAW (Primolius maracana) – Only a distant pair in flight at their nesting site this year. Later in the day we saw some closer ones in flight. 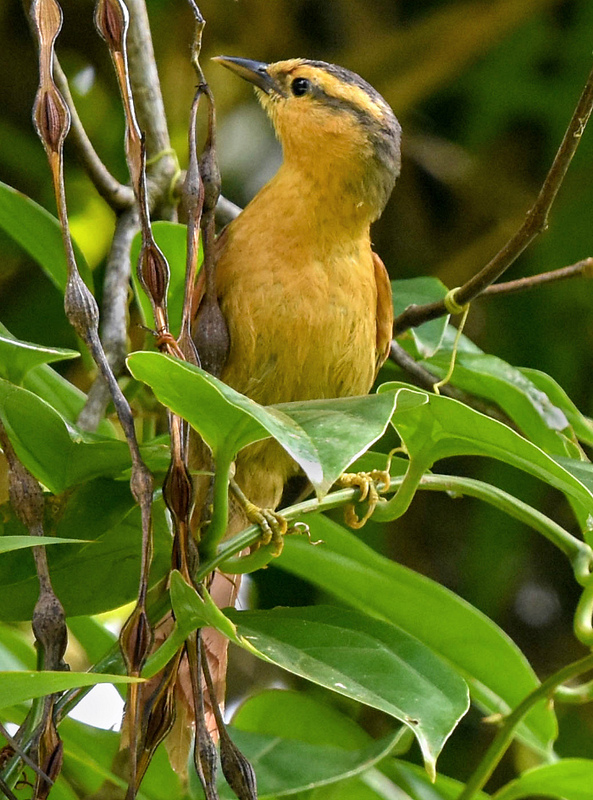 This lovely female Pin-tailed Manakin posed for a nice photo by participant Ted Kavanagh. Males are more colorful, but the females are quite charming in their own way! SPOT-BACKED ANTSHRIKE (Hypoedaleus guttatus) – Always a tricky bird to see, as it lives in the canopies of trees and likes to forage in dense vine tangles, but we had great looks at this one this year. GIANT ANTSHRIKE (Batara cinerea) – We had to work really hard for this one and with every failed attempt the Giant Antshrike grew larger, but in the end we had glorious views of a male and a female. WHITE-BEARDED ANTSHRIKE (Biatas nigropectus) – I still can't believe that we saw this shy bamboo specialist through the scope. CHESTNUT-BACKED ANTSHRIKE (Thamnophilus palliatus) – Great looks at REGUA. SOORETAMA SLATY-ANTSHRIKE (Thamnophilus ambiguus) – Formerly known simply as Slaty Antshrike, but the group was split into several species a few years ago. This one is an Atlantic Forest Endemic. STAR-THROATED ANTWREN (Rhopias gularis) – Not only a cute little bird but one that lives and forages close to the ground. Giving our necks a much appreciated break. RUFOUS-BACKED ANTVIREO (Dysithamnus xanthopterus) – A high altitude specialist that we saw extremely well at Pico Caledonia. A Green-crowned Plovercrest, photographed by participant Ted Kavanagh. WHITE-FLANKED ANTWREN (SILVERY-FLANKED) (Myrmotherula axillaris luctuosa) – This is a potential split from the nominate species. We saw it well at REGUA. 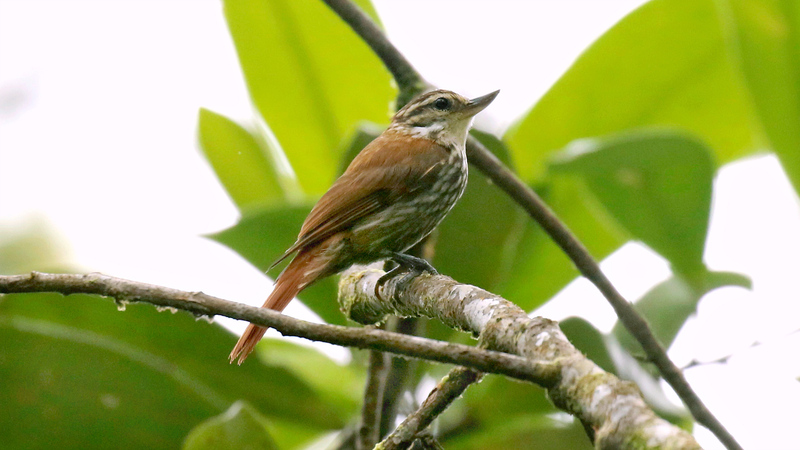 UNICOLORED ANTWREN (Myrmotherula unicolor) – Lowland Atlantic forest is a rare habitat, and therefore it is no surprise that this species, that only occurs in lowland forest, is quite rare. REGUA is one of the best places to see this one. SERRA ANTWREN (Formicivora serrana interposita) – A bird of the drier interior that we saw well on the day we looked for the Three-toed Jacamar. STREAK-CAPPED ANTWREN (Terenura maculata) – Always a challenging bird as it travels with canopy mixed species flocks but we managed to get a few people on it. BLACK-CHEEKED GNATEATER (Conopophaga melanops) – This striking Gnateater is always a crowd pleaser. VARIEGATED ANTPITTA (Grallaria varia) – One of the highlights of the tour was seeing this shy forest dweller so well. SLATY BRISTLEFRONT (Merulaxis ater) – High on everyone's list of wanted birds and one that I was a little nervous about as we missed it entirely last year. But we had great looks at a pair on the road to Macae de Cima. RUFOUS-CAPPED ANTTHRUSH (Formicarius colma) – Great looks on the CEDAE Trail. SUCH'S ANTTHRUSH (Chamaeza meruloides) – We nailed this one on our very first day at the lodge. WHITE-THROATED WOODCREEPER (Xiphocolaptes albicollis) – Brief but good views of this massive Woodcreeper on one of the trails at Itororo lodge. 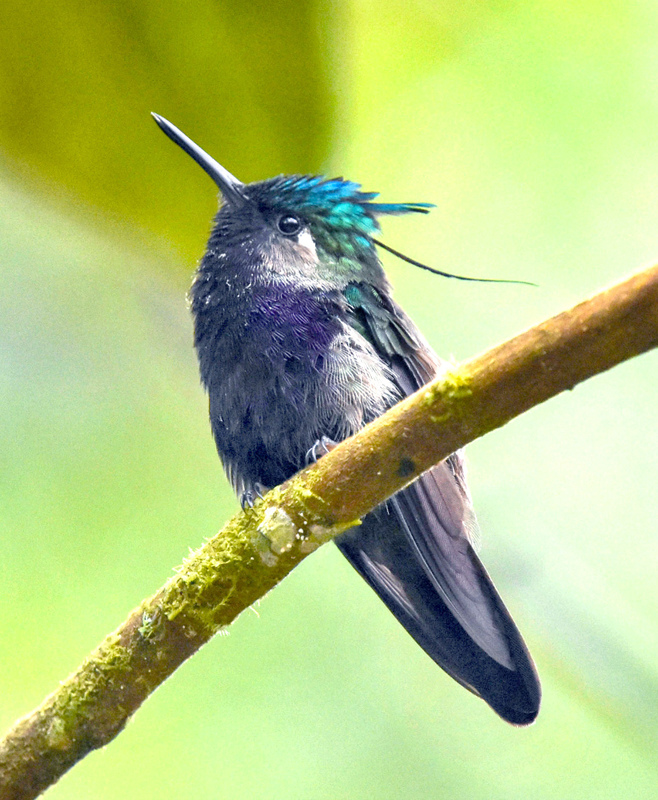 This Streaked Xenops is sitting at just the right angle to see its unique bill. Photo by participant Claudi Racionero. BLACK-BILLED SCYTHEBILL (Campylorhamphus falcularius) – A bamboo specialist and a very hard one to see well, but we had great looks at one that was traveling with a mixed species flock at Itororo Lodge. WING-BANDED HORNERO (Furnarius figulus) – Great views on the day that we drove inland. WHITE-COLLARED FOLIAGE-GLEANER (Anabazenops fuscus) – Great looks at this striking bamboo specialist right around the lodge. 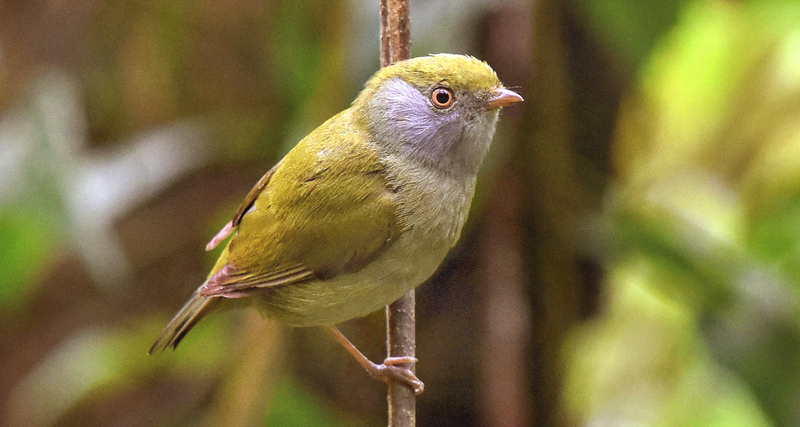 BUFF-FRONTED FOLIAGE-GLEANER (Philydor rufum) – The most common foliage gleaner along our tour route. We even found a nest. We had a few nice looks at the endemic Spot-billed Toucanet. Photo by participant Ted Kavanagh. RUFOUS-FRONTED THORNBIRD (Phacellodomus rufifrons) – Seen on the day we went inland. ORANGE-EYED THORNBIRD (Phacellodomus erythrophthalmus) – Great views on the lodge grounds. 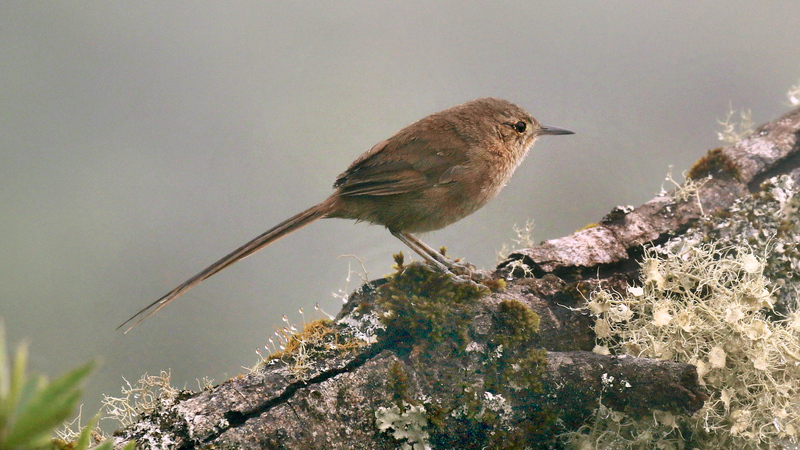 ITATIAIA SPINETAIL (Asthenes moreirae) – A high altitude specialist that was seen extremely well on our visit to Pico Caledonia. A Red-legged Seriema posed for this amazing portrait by participant Claudi Racionero. OCHRE-BELLIED FLYCATCHER (Mionectes oleagineus) – Good views at REGUA. SERRA DO MAR TYRANNULET (Phylloscartes difficilis) – Another difficult species that was seen really well at Pico Caledonia. PLANALTO TYRANNULET (Phyllomyias fasciatus) – Common around the lodge. EARED PYGMY-TYRANT (Myiornis auricularis) – This minute bird is part of the genus Myiornis that has the distinction of holding the title for the smallest passerines in the World. We found a couple of individuals on the road to Macae de Cima. DRAB-BREASTED PYGMY-TYRANT (Hemitriccus diops) – Better than usual looks at this hard to see bamboo specialist. EYE-RINGED TODY-TYRANT (Hemitriccus orbitatus) – Seen in the lowland forests of REGUA. OCHRE-FACED TODY-FLYCATCHER (Poecilotriccus plumbeiceps) – A pair of birds nesting along the trails at Itororo Lodge. CLIFF FLYCATCHER (SWALLOW) (Hirundinea ferruginea bellicosa) – Always present on the roof of one of the buildings at Itororo Lodge. BLACK-TAILED FLYCATCHER (BUFF-RUMPED) (Myiobius atricaudus ridgwayi) – Brief views of an individual moving through the forest with a mixed species flock. BLUE-BILLED BLACK-TYRANT (Knipolegus cyanirostris) – Seen at Pico Caledonia. STREAMER-TAILED TYRANT (Gubernetes yetapa) – What a fantastic bird! I just never get tired of seeing them displaying. MASKED WATER-TYRANT (Fluvicola nengeta) – Seen nicely along the lake at REGUA. Maroon-bellied Parakeets were common at the lodge's feeders. Photo by participant Ted Kavanagh. GRAY-HOODED ATTILA (Attila rufus) – Great looks at this handsome flycatcher on the road to Macae de Cima. SHARPBILL (Oxyruncus cristatus) – A monotypic family so it was particularly nice to see it in the scope. 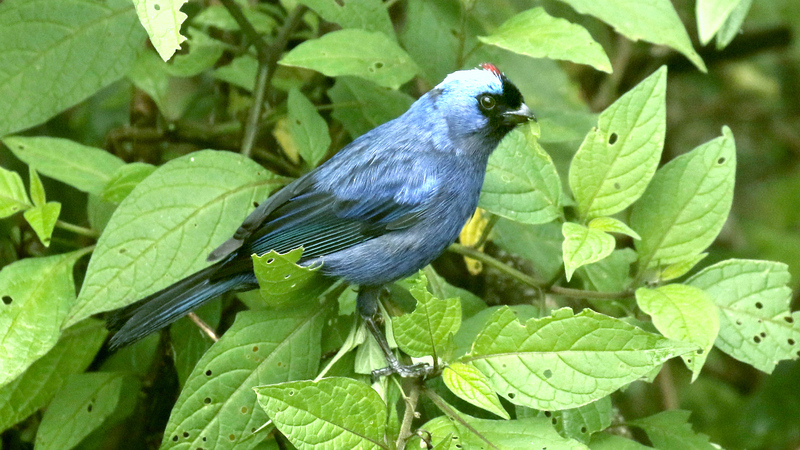 We found this lovely Diademed Tanager when we visited Pico Caledonia. Photo by participant Claudi Racionero. SWALLOW-TAILED COTINGA (SWALLOW-TAILED) (Phibalura flavirostris flavirostris) – I have to admit I was starting to sweat after several minutes waiting for this one at our usual spot but we ended up having great views of it. BLACK-AND-GOLD COTINGA (Tijuca atra) – Good views on our way down from Pico Caledonia. BARE-THROATED BELLBIRD (Procnias nudicollis) – Hearing this bird is almost as good as seeing one. Nevertheless we had great scope views. SERRA DO MAR TYRANT-MANAKIN (Neopelma chrysolophum) – After multiple failed attempts we managed to pull one into view. PIN-TAILED MANAKIN (Ilicura militaris) – Always a treat to see well, but Tiffany was particularly happy to see this one. WHITE-BEARDED MANAKIN (Manacus manacus gutturosus) – A few individuals seen at REGUA. GREEN-BACKED BECARD (Pachyramphus viridis) – Seen right outside the restaurant at Itororo Lodge. Once we found it, this Long-billed Wren sat quietly while participant Ted Kavanagh got this fine portrait. CRESTED BECARD (Pachyramphus validus) – A brief sighting on the road to Macae de Cima. RED-EYED VIREO (MIGRATORY CHIVI) (Vireo olivaceus chivi) – After many years of being in a taxonomic limbo, considered a subspecies of Red-eyed Vireo, this species has finally been split and is now called Chivi Vireo. CURL-CRESTED JAY (Cyanocorax cristatellus) – A species of the savannas of central Brazil that has moved into the area due to forest clearing. TAWNY-HEADED SWALLOW (Alopochelidon fucata) – Great looks at a couple of birds that were nesting on a bank on the day we went into the drier interior. HOUSE WREN (Troglodytes aedon) – Common around the lodge. LONG-BILLED WREN (Cantorchilus longirostris) – This species made us work for it but we eventually got good looks at this endemic at REGUA. RUFOUS-BELLIED THRUSH (Turdus rufiventris) – The national bird of Brazil, due in great part to its beautiful song that can be heard in most cities of Brazil. Still a bit of a surprise to have this bird chosen over so many beautiful birds that are endemic to Brazil. WHITE-BROWED WARBLER (Myiothlypis leucoblephara) – Formerly known as White-rimmed Warbler. MAGPIE TANAGER (Cissopis leverianus) – Seen at the Lodge's feeders regularly. CHESTNUT-HEADED TANAGER (Thlypopsis pyrrhocoma) – This gorgeous bamboo specialist was seen right around the lodge. 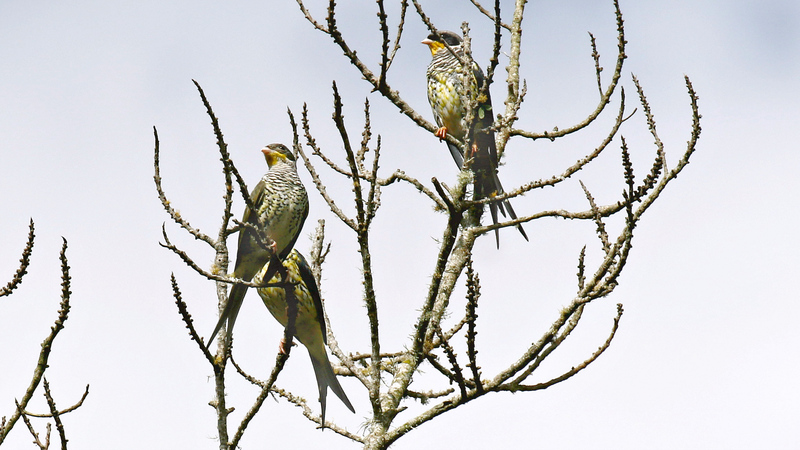 We were afraid we might miss the elegant Swallow-tailed Cotinga, but we found this nice group that allowed us a great view. Photo by participant Claudi Racionero. RUBY-CROWNED TANAGER (Tachyphonus coronatus) – Always very hard to see the Ruby crown but they are common visitors at the feeders at the lodge and a few people had glimpses of a male displaying its red feathers. DIADEMED TANAGER (Stephanophorus diadematus) – Close up views of this handsome tanager at Pico Caledonia. FAWN-BREASTED TANAGER (Pipraeidea melanonota melanonota) – Another great bird that was seen right outside the restaurant at Itororo. AZURE-SHOULDERED TANAGER (Thraupis cyanoptera) – Always a treat to compare this species right next to Sayaca Tanagers at the feeders of Itororo Lodge. GILT-EDGED TANAGER (Tangara cyanoventris) – Great views on our way to the Three-toed Jacamar spot. Serra do Mar Tyrant-Manakin was another one we had to work for, but we ended up with great looks! Photo by participant Ted Kavanagh. YELLOW-BACKED TANAGER (Hemithraupis flavicollis insignis) – Seen with canopy flocks at REGUA. BAY-CHESTED WARBLING-FINCH (Castanozoster thoracicus) – Great views at Pico Caledonia. GRASSLAND YELLOW-FINCH (Sicalis luteola) – This was a bit of a surprise. We had some of them from an outlook outside of the town of Duas Barras. 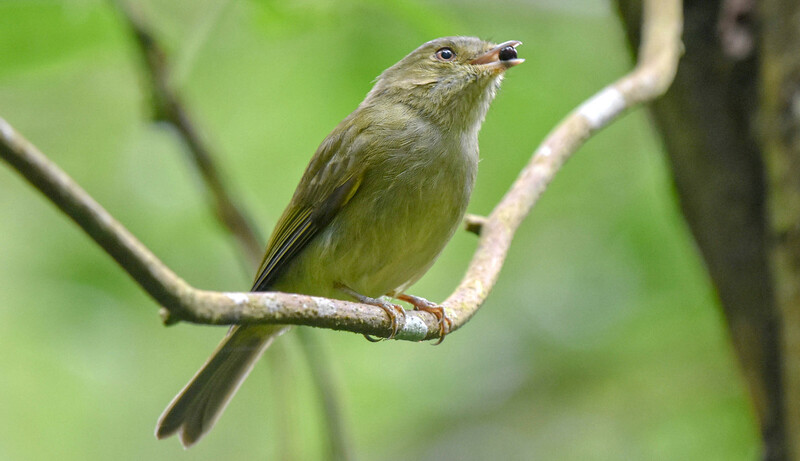 THICK-BILLED SALTATOR (Saltator maxillosus) – Another species that is found in higher altitudes and was seen well at Pico Caledonia. RUFOUS-COLLARED SPARROW (Zonotrichia capensis) – One of the most common and widespread species in the mountains of South America. One of the hummingbirds we saw well was this Brazilian Ruby. Photo by participant Claudi Racionero. CRESTED OROPENDOLA (Psarocolius decumanus) – Multiple views of these birds and their nests. GIANT COWBIRD (Molothrus oryzivorus) – Hanging around the nests of the Crested Oropendolas in hopes of laying its eggs in their nest. BLUE-NAPED CHLOROPHONIA (Chlorophonia cyanea) – Andy had a new feeder staked out for us and we got great looks at colorful species. HOODED SISKIN (Spinus magellanicus) – Good looks at some males and a few females at the base of Pico Caledonia.